Uses: As a very minor ore of nickel and as mineral specimens. Gersdorffite, which is named for Johann von Gersdorff, the owner of the mine at which it was found, is a very uncommon nickel mineral that belongs to the Cobaltite Group of minerals. Most members of this group are rare to extremely rare except for cobaltite. Like other members of this group, gersdorffite can form nice crystals that are either cubic, octahedral, tetrahedral or even pyritohedral, the classic crystal form of pyrite. Gersdorffite's symmetry is isometric and it has the same unique symmetry as pyrite, skutterudite and cobaltite. They all belong to the Diploidal symmetry class; bar 3 2/m, a class that, although isometric, lacks four fold symmetry. The gersdorffite structure is similar to pyrite's except that the S2 groups of pyrite are replaced by As-S groups in gersdorffite. The arsenic and sulfur are bonded together with a covalent bond. If the arsenic and sulfur have an ordered arrangement (such that all of the arsenic atoms are to the left or all are to the right of the As-S bonds), then the symmetry is reduced to the lower symmetry of the Tetartoidal Class; 2 3. This is the lowest symmetry class of the isometric system and contains only three fold and two fold axes. Most gersdorffite has an unordered arsenic-sulfur structure and therefore belongs to the higher Diploidal symmetry class. 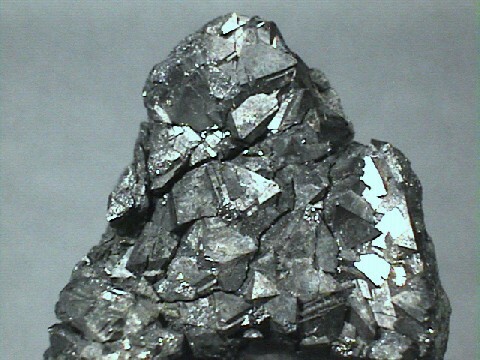 Gersdorffite is very similar to a nickel antimony sulfide called ullmannite. Ullmannite's formula is NiSbS and shows the substitution of antimony for the arsenic in gersdorffite's formula. The two elements are themselves very similar and therefore do not cause appreciable differences in their respectively enriched minerals. The two minerals are almost indistinguishable by ordinary means although gersdorffite is much more common. Gersdorffite forms a solid solution series with cobaltite, meaning the nickel and cobalt in the two minerals are substitutable. Both minerals are found in magma derived sulfide deposits. Gersdorffite is also found in hydrothermal veins that crystallized at moderate temperatures. Color is white to gray. Crystal System: Isometric; bar 3 2/m. Crystal Habits include cubic, octahedral, tetrahedral and pyritohedral crystals (sometimes tabular) as well as massive and granular forms. Cleavage is good in three directions forming cubes. Other Characteristics: Crystals are sometimes striated. Associated Minerals include nickeline, wollastonite, sphalerite, calcite, pyrrhotite, lollingite, annabergite, skutterudite, cobaltite, arsenopyrite, erythrite, nickelskutterudite, pentlandite, siderite and other nickel and iron minerals. Best Field Indicators are crystal habit, cleavage, hardness and density.